Our culture is based on the adaption to change, carrying out the job with quality and efficiency, where iniciative and team work are important values, always united to respect other people. For these reasons we are a committed businness with job equality (equality within the job) generating a surrounding free from discrimination of any type, where people can grow professionally in relations and potencial. If you are looking for a dynamic job, stability and wish to enrich and develop your professional carrer in a diverse and respectful enviroment we offer you possibility to find it by working with us. 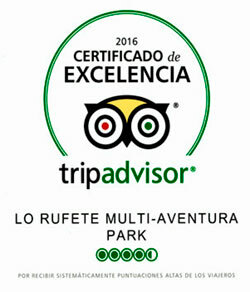 Lo Rufete Multiaventura Park is a commited business regarding equal opportunities and intergration. Our business offers you the possibility of being included in it´s data base to become part of the selection process that occurs, regulary. If you are interested you can send us your CV through the following form.